“What’s your sign,” bartender and part-owner Bowen Goh told a patron one recent night. It wasn’t the 1970s clichéd pickup line. 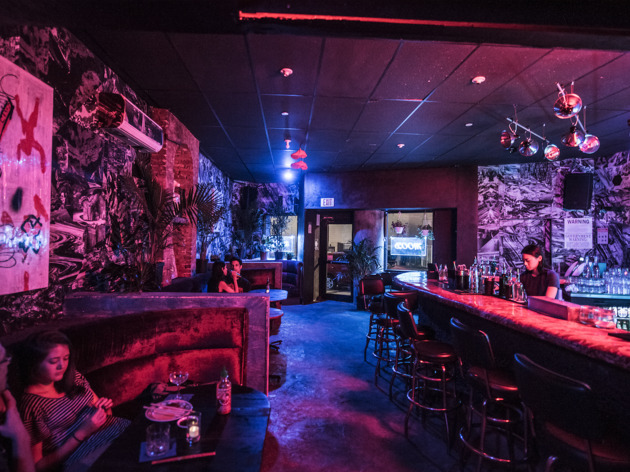 It’s the 21st century now: It was the Wi-Fi password at Mood Ring, the astrology-themed bar that opened in September. 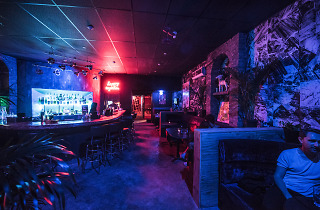 The name conjures a psychedelic den with Agnes Moorehead or Stevie Nicks tucked into crushed-velvet booths, but Mood Ring defies expectations. 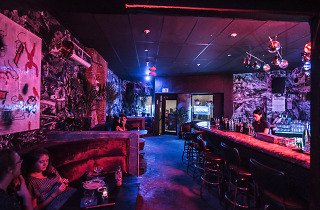 There are velvety booths, but also a homemade arcade game called Yo Fight My Mans and erratic art, including red sneakers dangling from the ceiling. It’s, like, very L.A. The Outkast, a liquefied flower-crown of rose and lavender, resonated once the unnecessary seltzer ran dry and the sunken rose syrup flourished (the rose petal in the ice cube was cute, though). 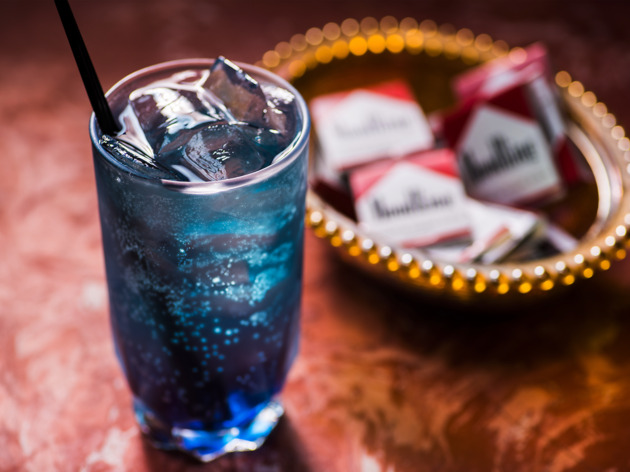 The electric blue Mercury in Retrograde dazzles as a green-tea spin on Long Island iced tea. Meanwhile, the zodiac-seasonal quaff, Libra’s gin-and-prosecco elderflower-kissed Say No More, expertly transcends the gulf between a merely herbal and a properly botanical profile, despite the plain mint-leaf garnish. The fiery shot Aux Cord—vodka, sriracha, tomato juice and Tabasco—lashes audacity as it spills like daybreak across the tongue. Alas, $9 Jarritos mixed with any liquor (mostly tequila) taste like the wine coolers high schoolers pilfer from their parents’ liquor cabinet. And Bodega Dreams, the shot of whiskey infused with AriZona iced tea, tiptoes dangerously close to Four Loko territory. It tastes like insecurity and regret. Mood Ring’s magic, like its namesake, is in the way it heightens awareness. You find yourself willing surroundings to change. The universe obliges. Blink and a clique of Snapchatting Beckys becomes a squad of gaymer bros clinking beers. It’s a place for everyone and anyone. 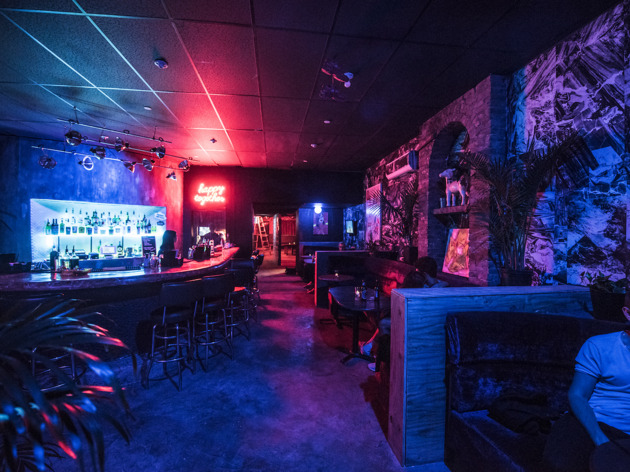 The venue’s omnipresent rainbow LEDs throb at a gentle, tidal pace, giving the place more of a heartbeat than a bassline. When you’re drunk enough, order the pork dumplings and discover that this is all a front for what could be a dumpling speakeasy. Plump, succulent meat is wrapped in gnocchi-thick pasta so exquisite that Goh is called over to reveal where he procures it. “My grandma makes them. I go to her place in Great Neck [Long Island] and bring them back.” And whatever other spell this bewitching city has cast on you fades under the glow of his bright purple mane.